So, I decided that I’d like to use each Thursday to post something I recommend, whether it be a recipe, baby product, or mommy product. For my first Thursday Tip, I’d like to share an awesome recipe for vegetarian chili, made in the slow cooker. With football season right around the corner, this is the perfect time to start thinking about some chili!! Side note: I should probably take a moment to share that I’m actually a vegetarian (aka hippie, as JD likes to call me). Not all recipes I post will be vegetarian (while I was pregnant with L, I craved meat like it was the only acceptable food for baby-growing), but this one just happens to be. Throw everything into the slow cooker and cook for at least 2 hours on high (although we usually cook ours for 4 hours or so). Serve however you like your chili. JD likes his over rice, sometimes I’ll put crushed tortilla chips in mine, and there’s always, ALWAYS cheese involved. Since we’re really only cooking for the 2 of us (L doesn’t count yet), we always have plenty of leftovers, so I’ll put enough in the fridge to have leftovers the next day and freeze the rest for a rainy day. 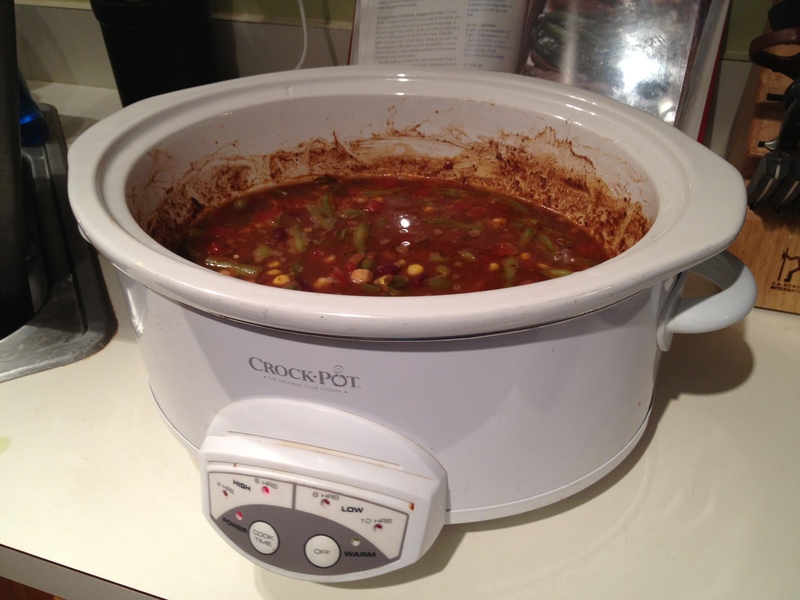 This entry was posted in Thursday Tip and tagged Easy meals, Healthy Eating, Recipe, Slow Cooker. Bookmark the permalink.